Get ready for an exciting voyage around the world! This year your child will travel to all seven continents and learn about the land and cultures of the world. While studying Grade 7: Exploring Your World, your child will meet families from around the globe and get a fascinating look at how they live and what they eat; you’ll explore various landscapes, from the tropical rainforests of Brazil and Papua New Guinea to the Sahara Desert and the frozen wasteland of Antarctica and you’ll complete a variety of projects, from creating different types of maps to creating international works of art. This year is packed full of great books and open ended projects! The literature this year takes you to many destinations, from a road trip across the United States with Salamanca and her grandparents in Walk Two Moons , across the Pacific Ocean in an ancient balsa raft in Kon-Tiki: Across the Pacific in a Raft , and to distant galaxies far beyond our own in the The Hitchhiker’s Guide to the Galaxy. You’ll also study the religions of the world and learn about the variety of belief systems, from the more common (Christianity and Islam) to the less known native religions, and even ancient beliefs. You will also study a variety of myths about the origins of the world in In the Beginning: Creation Stories from Around the World . Your science focus this year is Chemistry, using Elemental Science’s Chemistry for the Logic Stage program. This hands on, literature based study will guide you on an unforgettable journey around the world, right from the comforts of your home. I hope you enjoy studying it as much as I enjoyed putting it together! As a reminder, if you are going to purchase books we would greatly appreciate the use of our provided Amazon Links! Thanks! 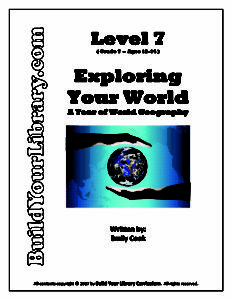 Have you already purchased Level 7 – Exploring Your World? We would love to hear what you think and share your experience with others – Please feel free to leave a product review on the Contact Us page! Thanks for your support!